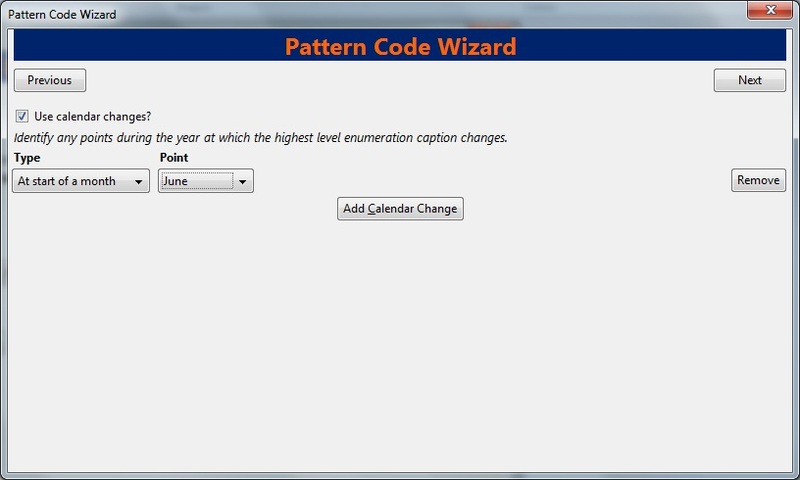 The Captions and Patterns wizard allows you to enter caption and pattern data as it is described by the 853, 854, and 855 MARC tags. These tags allow you to define how issues will be captioned, and how often the library receives issues of the serial. Click the Captions and Patterns tab. Click Add Caption and Pattern. In the Type drop down box, select the MARC tag to which you would like to add data. In the Pattern Code drop down box, you can enter a JSON representation of the 85X tag by hand, or you can click the Wizard to enter the information in a user-friendly format. The Caption and Pattern that you create is Active by default, but you can deactivate a caption and pattern at a later time by unchecking the box. 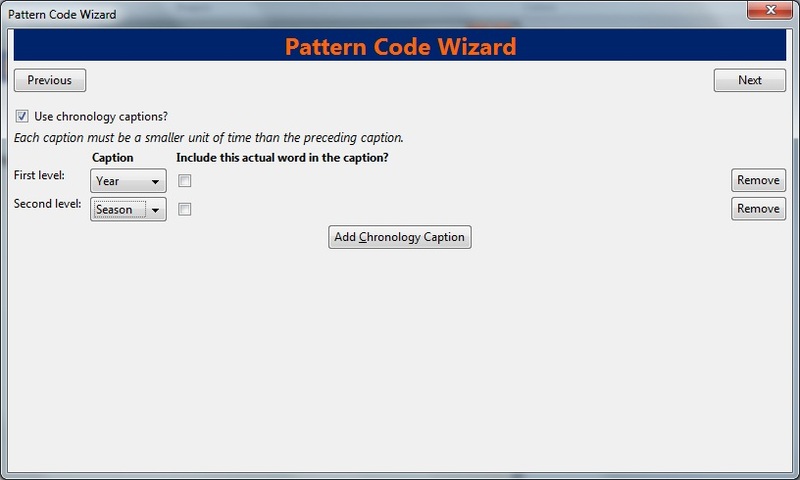 A subscription may have multiple captions and patterns listed in the subscription details, but only one Caption and Pattern can be active at any time. If you want to add multiple patterns, e.g. for Basic and Supplement, Click Add Caption and Pattern. 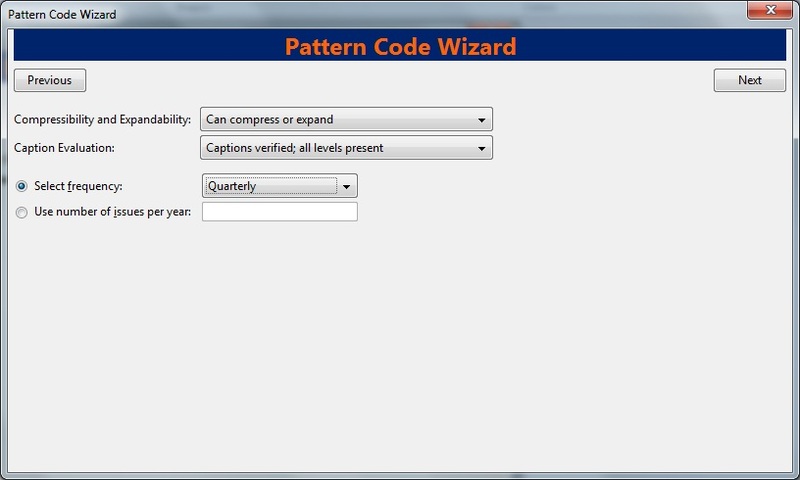 The Pattern Code Wizard enables you to create the caption of the item and add its publication information. The Wizard is composed of five pages of questions. You can use the Next and Previous navigation buttons in the top corners to flip between pages. 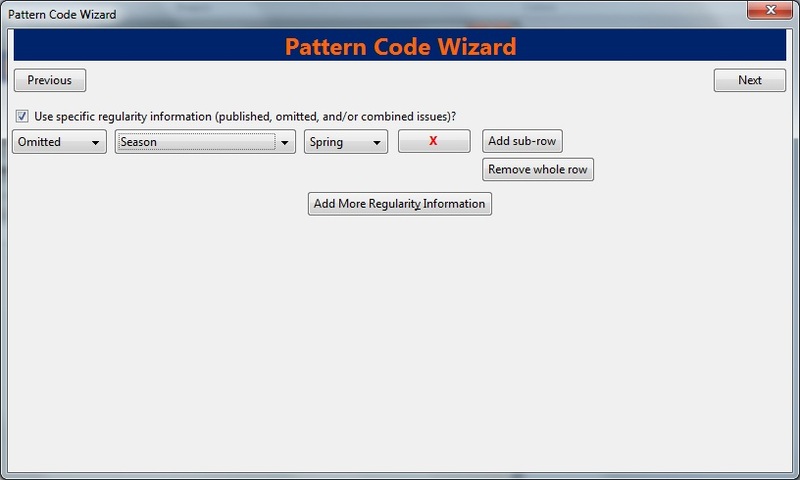 To add a pattern code, click Wizard. To add an enumeration, check the box adjacent to Use enumerations. The enumerations conform to $a-$h of the 853,854, and 855 MARC tags. A field for the First level will appear. Enter the enumeration for the first level. A common first level enumeration is volume, or "v."
A field for the Second level will appear. Enter the enumeration for the second level. A common first level enumeration is number, or "no." Enter the number of bibliographic units per next higher level. This conforms to $u in the 853, 854, and 855 MARC tags. Choose the enumeration scheme from the drop down menu. This conforms to $v in the 853, 854, and 855 MARC tags. You can add up to six levels of enumeration. Add Alternate Enumeration if desired. When you have completed the enumerations, click Next. To use months, seasons, or dates in your caption, check the box adjacent to Use calendar changes. Identify the point in the year at which the highest level enumeration caption changes. In the Type drop down menu, select the points during the year at which you want the calendar to restart. To add another calendar change, click Add Calendar Change. There are no limits on the number of calendar changes that you can add. When you have finished the calendar changes, click Next. To add chronological units to the captions, check the box adjacent to Use chronology captions. Choose a chronology for the first level. If you want to display the terms, "year" and "month" next to the chronology caption in the catalog, then check the box beneath Display in holding field. To include additional levels of chronology, click Add Chronology Caption. Each level that you add must be smaller than the previous level. After you have completed the chronology caption, click Next. Select the appropriate option for compressing or expanding your captions in the catalog from the compressibility and expandability drop down menu. The entries in the drop down menu correspond to the indicator codes and the subfield $w in the 853 tag. Compressibility and expandability correspond to the first indicator in the 853 tag. Choose the appropriate caption evaluation from the drop down menu. Choose the frequency of your publication from the drop down menu. For irregular frequencies, you may wish to select use number of issues per year, and enter the total number of issues that you receive each year. However, recommended practice is that you use only regular frequencies. Planned development will create an additional step to aid in the creation of irregular frequencies. 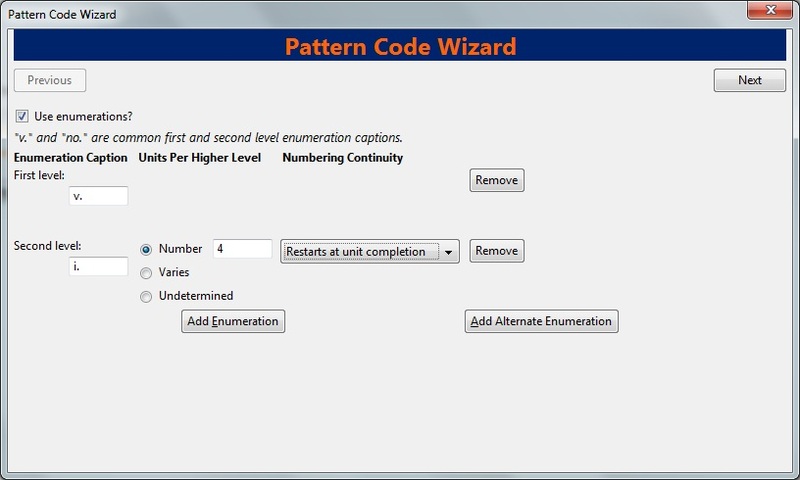 To complete the wizard, click Create Pattern Code. Confirm that the box adjacent to Active is checked. Click Save Changes. The row is now highlighted gray instead of orange.